For the first time in the CBCS history we have an overtime game. 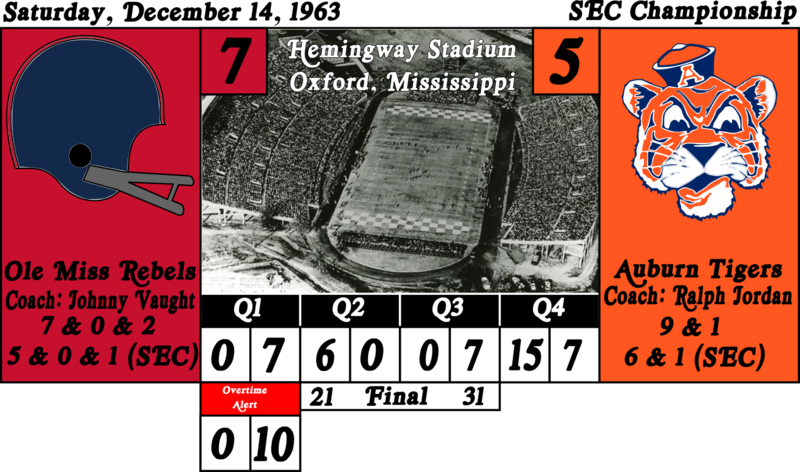 Auburn was making their CBCS debut in this game while Ole Miss was the defending SEC champion. Last year the Rebels made it all the way to the National Championship, only to lose in that game to USC. Auburn was the higher ranked team but because Ole Miss had the better in division record they were the home team for this game. No problem for the Tigers. They were not intimidated. This was the first meeting between these two clubs this year and in the middle of the first quarter the Tigers would be the first to score when they got a touchdown off a 13-yard pass. The quarter would end with the Auburn leading 7-0. The second quarter would start with an Ole Miss drive that ended on a 38-yard field goal that put them on the score board. Auburn now lead 7-3. Both offenses would struggle to develop anything for most of the rest of the first half. On what would be their final possession of the half, Ole Miss found themselves stalled near mid-field. Desperate to bring the score tighter before the half the Rebels kicked a 50-yard field goal that brought the score to 7-6. On their first possession of the second half of the game the Rebels strung together a solid drive down field. They had a chance to take the lead on a 15-yard field goal attempt but somehow, they missed. Auburn would make the Rebels pay for that mistake. They came down the field and ultimately got into the end zone on a 6-yard pass. The Tigers now lead 14-6. That is the spot at which the third quarter would end. If this game had seemed uneventful thus far, the fourth quarter would change all that. Missed kicks would come back to haunt the Ole Miss Rebels. The Rebels would put together an early scoring drive. They set up for a 17-yard field goal and this time hit it. Now the score was 14-9. Their defense would contain the Auburn Tigers and Ole Miss would get the ball back. The Rebels impressed as they drove the ball down the field. Getting to the goal line they set up their running back to push the ball over the goal line and get their first touchdown of the game. Their kicker however would miss the PAT leaving the score at 14-15. Ole Miss now lead. Having surrendered the lead in the fourth quarter, Auburn responded in short order. They put up a huge 75 yard passing play that got them another touchdown. Their kicker did not fail to make the PAT. Auburn now had the lead back at 21-15. A few possessions would go by and finally on the final drive of the quarter Ole Miss had the ball. They drove down the field and scored on an 11-yard pass. This tied the game at 21. With the PAT the Rebels had an excellent opportunity and almost felt assured to win. THEY MISSED! With no time left on the clock the game was headed for overtime. The CBCS has rules of their own that dictate overtime in their games. As this is the first such occurrence that they apply it is worth going over those rules now. Over time in any CBCS game works like this. If after regulation the game is tied they proceed to play an extra period under traditional rules. If after this extra period the game remains tied they play a second overtime period under traditional rules. Now if after two full overtime periods go by and the score is still even then they play a field goal shoot out, much like a shoot out in hockey. If this shoot out is a tie then the lower ranked team will be declared the winner and allowed to advance in the playoffs. If both teams are unranked then the team playing as the home team will be considered to be the winner. --- IN this game the overtime period belonged to Auburn. 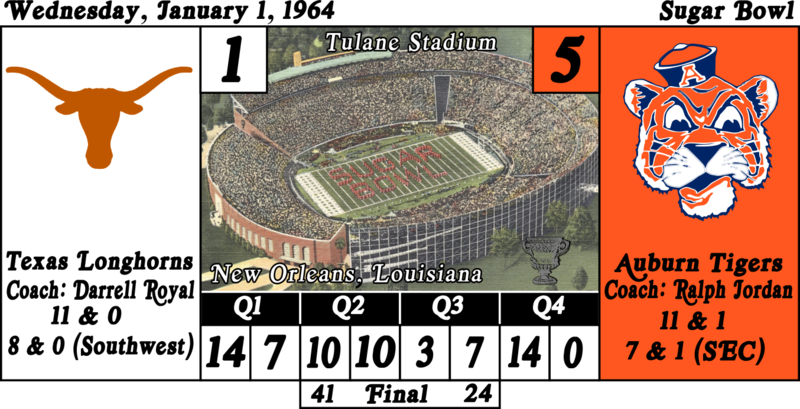 The Tigers first put together a drive that resulted in a 1-yard rush for a touchdown. Their kicker wasn’t missing and now they lead 28-21. Ole Miss tried their best to respond but could not. They soon turned the ball over and down the field went the Tigers again. This time they ended on an 11-yard field goal. Now the score was 31-21. The Tigers were now up by 10 points and at least two scoring plays. From that possession they set into a mode of running out the clock and delaying any progress of Ole Miss. That effort worked and that 31-21 score would be the final score. This Wild Card second round was a week of blowouts. Between the two games this was the biggest blowout and it eliminates the defending champion. So now after winning their first 4 games in the CBCS, USC has finally suffered a loss. In the first quarter the Illini only had two offensive possessions of their own. When they did have possession however they were profound in their control of the clock and ability to drive down time. The first of their two drives ended on a 17-yard passing play that resulted in a touchdown, putting them up 7-0. There second possession was not as lucrative on the scoreboard but with penalties against the Trojans and some persistence of will by the Illini they were able to eliminate a good chunk of time. In Illinois eyes they were the better team and if they could just outlast the unranked Trojans, they felt they would win. Just before the half Illinois punted. The Trojans were trying to make things happen but then their quarterback Pete Beathard was picked off and the Illini ran it back for a touchdown that put them up 14-0. USC got the ball back but had only time for one more offensive play before we moved into the second quarter. It was not deep into the second quarter when the Trojans found themselves forced to punt. Illinois got the ball back and set about orchestrating another clock control clinic. They came right down field and passed in a 15-yard touchdown that put them up 21-0. In an eerie situation USC, on their follow up drive, almost matched Illinois play-for-play on the previous play. Even the final pass for a touchdown was from 15 yards out. Now the Illinois lead was cut down to 21-7. Well if USC thought they were starting anything it would not take long for the Fighting Illini to show them otherwise. As the Trojans kicked the ball back to Illinois the Illini return man ran it back 99 yards for a touchdown. Now the score was 28-7 following the PAT. That was it for scoring in this half. From that point onward USC got the ball back but were forced to punt after just three plays. Then with the ball back and a healthy lead the Illini worked the clock to run out the remainder of the half. The third quarter was made up of 6 possessions. 3 by each team. 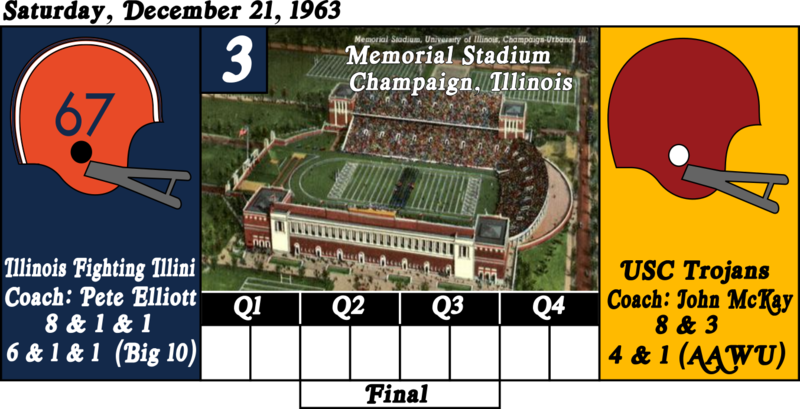 The first one belonged to the Illini and they worked it into another touchdown off a 21-yard passing play. Now their lead was up to 35-7. USC would get the ball back and they would make some progress but after a fumble deep in Illinois territory, the Illini got the ball back. This possession would be the shortest. USC would at first sack Illinois quarterback Mike Taliaferro. Then they made a tackle on second down after a gain of only 2 yards. On third down however Illinois would show their confidence by airing out a deep pass that resulted in an 81-yard touchdown. Now they were up 42-7 and they had just punched a hole in the side of the Trojans defense-ship. USC would come down the field themselves one more time in the quarter. They set up for a 21-yard field goal but wound up missing it. Not only was the inability to score disheartening so too was the fact that so much time was invested in the drive for nothing. Then again what did it really matter they were down 35 points. For the final drive of the quarter Illinois had possession. Once again, the controlled the clock. This time the artistically manipulated things until they got a 33-yard passing touchdown right at the end of the quarter. Now they were up 49-7. The pass was all the more thrilling because it wasn’t tossed by their quarterback but rather by the Fullback on a trick play. The fourth quarter was rather boring. USC quit. They were defeated and they knew it. That did not prevent Illinois from running up the score a bit however. The Illinois were able to get into USC territory but they accepted just punching through a 32-yard field goal to bring the score to 52-7. Then late in the quarter the Illini would march down the field again and score a touchdown on a 1-yard rushing play. This brought the game to its final score of 59-7. In a week of a pair of blowouts, this was a strange one. One thing was clear, Nebraska was in a funk. They did not look at all like one of the top six teams in the nation. The Cornhuskers only loss up until tonight this year was to Air Force back on October 12. That game was a much tighter affair at 17-13. In this one Auburn possessed the ball for nearly 75% of the time. Auburn did not run away with it by scoring in every possession but when they did give up the ball they made quick work of getting it right back. They did not allow the Nebraska offense to do anything. Even Nebraska’s lone score of the game came on a defensive play. 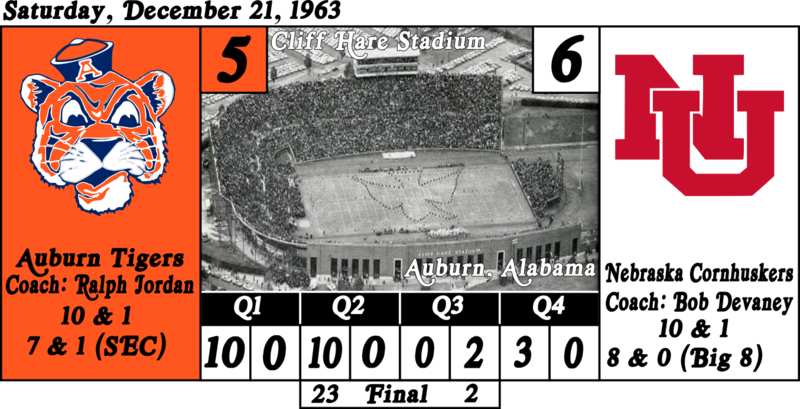 The first score came on Auburn’s first possession of the game. It ended on an impressive 46-yard field goal that put the Tigers up 3-0. On their next possession in the quarter they again worked down the field and this time pushed a 2-yard rush over the goal line for a touchdown that put them up 10-0. In the second quarter Auburn only had one strong offensive run. It was long consuming 50% of the quarters total time. It resulted in a 12-yard field goal that put the Tigers up 13-0. Later in the quarter Nebraska quarterback Dennis Claridge through what he thought was a safe short pass but an Auburn defender came between him and his receiver. That defender ran the ball back 70 yards for another touchdown that with the PAT pushed the score to 20-0. That is where the score would stand at halftime. The third quarter was an ugly mess. Penalties, dropped balls, and overall confusion made the whole matter unwatchable. The only scoring play in the quarter came in the middle of the quarter and it was as odd as anything else in the period. The Tigers were backed up to their own goal. In their own end zone, they handed the ball off to a back. 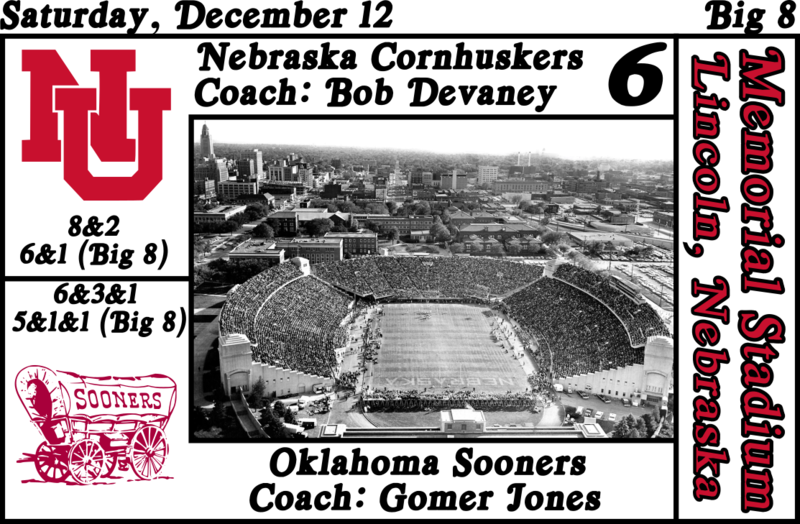 That back was tackled in the end zone and Nebraska was on the score board with 2 points. Now the score was 20-2. In the fourth quarter Auburn maintained the pace of the game. Once more they had the ball most of the time. Once more the quarter only had one scoring play. It was a 34-yard field goal for the Auburn Tigers. It pushed the score to its final total of 23-2. An unusual score for an unusual game. In the end thought the Tiger faithful got to celebrate with their team. 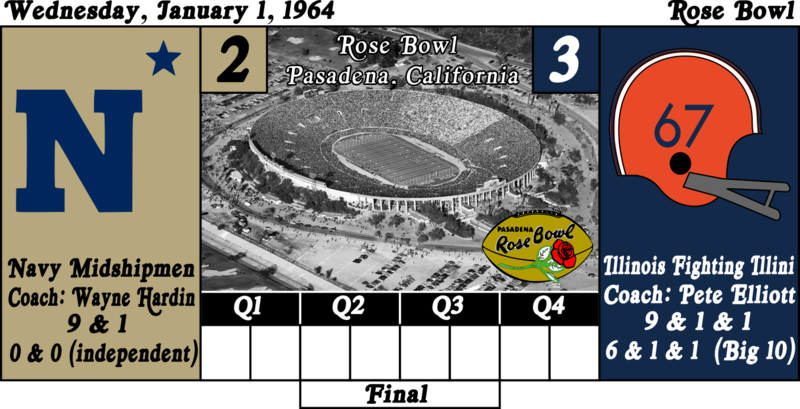 They are moving onto the Bowl Game semifinals, its just a question now of which will they be in the Rose Bowl or the Sugar Bowl. Who is going to which bowl? #1 Texas Longhorns will take on #5 Auburn Tigers in the Sugar Bowl. #2 Navy Midshipmen (finally making their CBCS debut) will take on #3 Illinois Fighting Illini. In their two previous games Illinois had been dominatingly impressive. They had defeated both of their previous opponents by a total of 61 points. No team however had yet won three games in a row in each of the first three rounds of the tournament. Last years champion, USC, won the whole tournament in 3 games but they had a 2nd round bye. Well this one was tight, Navy was certainly a formidable opponent. In the end however the Illinois Fighting Illini have just won themselves a trip to the National Championship in San Francisco. The first quarter got off to a bad start for them however. Illinois turned the ball over twice, once on a fumble and once on an interception. Following the fumble, the Illini defense contained the Navy offense but following the interception the Midshipmen would score. Not right away they did not get much of a return off of the interception but their offense came onto the field and set up a 28-yard field goal attempt. The kick was good and the Navy Midshipmen had the lead at the end of the first quarter 3-0. The second quarter was offensively the most efficient for both teams. It became a scoring explosion. First came Navy on the second possession of the quarter. Their offense set up for 1-yard rushing touchdown that got them to a score of 10-0. On the ensuing possession Illinois was finally able to put together their first scoring drive of the game. They marched down the field and set up for their own 1-yard rushing touchdown. This kept the score tight at 10-7. In kind Navy answered right back. Their offense orchestrated a campaign down the field and this one resulted in a 7-yard rushing touchdown. Now the Midshipmen were up 17-7. By now time was a concern but Illinois wanted to keep the score tight at the half and that they accomplished. They had to work down field taking much bigger gains this time but in the end, they did get into the end zone. This touchdown coming off a 29-yard pass. With little time left the score of 17-14 would stand at halftime. The third quarter belonged to the Illini. Their strong defense began to put a lot of pressure on the Navy offense. Navy fumbled the ball twice recovering it once but turning it over a second time. That second fumble came deep in the quarter and it would set up Illinois to take the lead. They came down field and set up for a 15-yard pass into the end zone. Now they were in front on the score board 21-17. Showing dominance in the third quarter it felt proper that Illinois should be leading this game, but their lead would be short lived. In Illinois’ lone mistake in the third quarter they let Navy return the kickoff following their touchdown 100 yards for a touchdown of their own. Now Navy was back up 24-21. That is where the third quarter would stand. As the fourth quarter wore on, Illinois was becoming desperate. They had the will to win but so did the Navy defense. The Midshipmen gave it their all to protect their lead through the games remaining time. On Offense the sailors could do nothing against the smothering Illinois defense. Navy’s best hope would be to protect the slight lead they had. 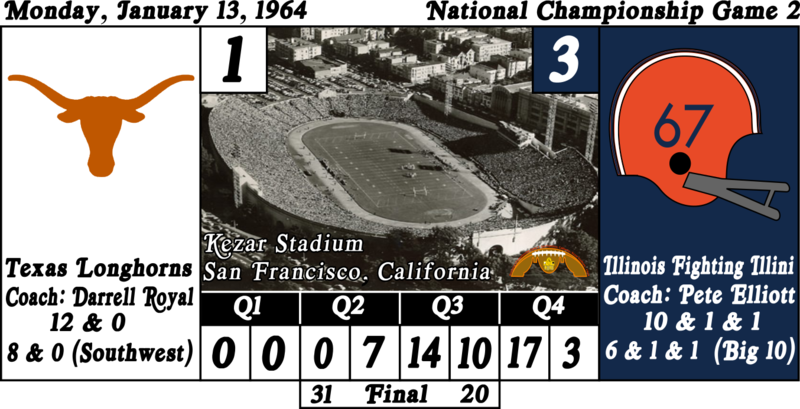 It seemed that might actually work because about halfway through the fourth quarter the Navy pressure caused Illinois to make a mistake and toss up a ball for an interception. Luckily for Illinois their defense prevented the mistake from turning into more Navy points. With about 4 minutes to go in the game the whole approach of each team flipped. Illinois was in possession of the ball and were putting together their most effective drive of the quarter. Finally, 16 yards out of the end zone their quarterback Mike Taliaferro put up a pass that was caught for a touchdown. Now it was Illinois who had the lead at 28-24. This time they made sure to stop any run back on the kickoff. From that point they had the luxury of protecting the lead. Their defense had already shown itself to be quite superior to the Navy offense, so with the small amount of time left, this process of protecting the lead was mostly procedural. Texas is having one hell of a year. Right from the start in this one they were showing it. On the opening drive of the game they came down the field and finished on a 17-yard pass for a touchdown. Right away they jumped out in front on the scoreboard 7-0. Thing is Auburn was no slouch and they answered right back. Their push down the field was clearly more difficult to come by. In the end of their opening drive they too however got a touchdown. Theirs coming off of a 19-yard rush. So now the score was 7-7. The Auburn drive had consumed a lot of time. Texas got the ball back and consumed most of the remainder of the time to complete another scoring drive. This one finishing on a 7-yard rush. With the score at 14-7, Texas was in the lead but Auburn still had a little time left with the ball before the end of the quarter. Not enough time however to get back into Texas territory. What stood out in the second quarter was actually the Auburn defense. They were giving the Texas Longhorns fits. Right from the Longhorns first possession of the quarter. While they limited the Longhorns, they still did not stop them from picking up a 32-yard field goal at the end of that possession. Now the score was 17-7. Auburn got the ball back themselves but only lasted 3 and out, so they punted it away. It was a good one and it looked like they were going to force Texas to a 3 and out themselves. Instead the Longhorns broke out for a 71-yard rush for a touchdown. This brought the score to 24-7. Auburn’s defense was giving things their all but it seemed Texas was pulling away. Just as they were about to get discouraged their offense picked them up. On the ensuing possession the Tigers were craft-fully guided by their quarterback down the field. On a 23 yard pass they reached the end zone, cutting the lead to 24-14. That drive energized the Auburn team both on the field and on the sidelines. Out came the defense on the ensuing Texas possession and once again the forced the Longhorns off the field in just 3 plays. If the Auburn Tigers last possession had been crafty this one was artistic at least until they got into the red zone. With precision Auburn’s QB sculpted his team into scoring position. Silly penalties stalled their progress however and they were forced to settle for a field goal that brought the score to 24-17. That is how the half would finish. The Auburn Tigers defense had flexed their muscle in the second quarter now they wished to carry on in the second half. Early in the quarter they picked off the Longhorns quarterback. Down only 4 points, it looked like they could even this game up. Texas however had an undefeated record that they were not willing to squander now, half a game away from a National Championship Game appearance. They prevented the turnover from becoming Tigers points. Getting the ball back themselves the Longhorns came into scoring territory. They could not get a touchdown but rather settled for a 15-yard field goal. This pushed the lead back up to a more comfortable spot of 27-17. Auburn coach “Shug” Jordan was hot after they blew that opportunity only to allow Texas to build on their lead. He was getting onto his guys on the sideline and something resonated. Auburn made better use of possession of the ball this time around. They got all the way up to the goal line and then pushed it over on a 1-yard rush. The score was not 27-24. This would be the balance of scoring in the third quarter. It was not however in fact balanced. This was the first, and would end up the only, quarter of the game where Auburn outscored the Longhorns. Texas made some mistakes in the fourth quarter. They made some big ones and yet somehow, they came out smelling like, well I guess in this game “sugar” instead of “roses”. Their first drive of the quarter ended in an interception. Auburn got the ball back and were determined to score. A touchdown would give them the lead, a field goal would at the least tie the game. However, on their drive they would fumble the ball twice. The first time they recovered their own blunder but the second time Texas took possession of the ball. That turnover would hurt. Texas went down the field and scored. Now they lead 34-24. Auburn got the ball back and what did they do with it? Through an interception, that is what. It was now becoming clear, Texas was going to win this one. They once again turned a turnover into a touchdown. This one came very quickly. Two plays after the interception Texas rushed the ball into the end zone from 62 yards out. Now the score was 41-24. The score had ballooned. What was actually a close game now was looking something like a blowout. In the junk time however, the Longhorns did throw another interception of their own. As their luck would have it however Auburn could do nothing with the turnovers when they got them. Clearly Auburn had been defeated. Texas was going to the National Championship Game in San Francisco. The CBCS hold their annual meetings just before the national championship game. At the meetings they deal with the matters that pertain to the coming seasons. After the meetings they held a press conference to make public the matters that are to be made public. First of all, they announced that Soldier Field in Chicago, Illinois will be the host of the third National Championship Game. The games official logo, inspired by the Neoclassical columns of the stadiums most prominent feature, the east and west buildings, is presented. So now with this new information we go into a new round of voting. 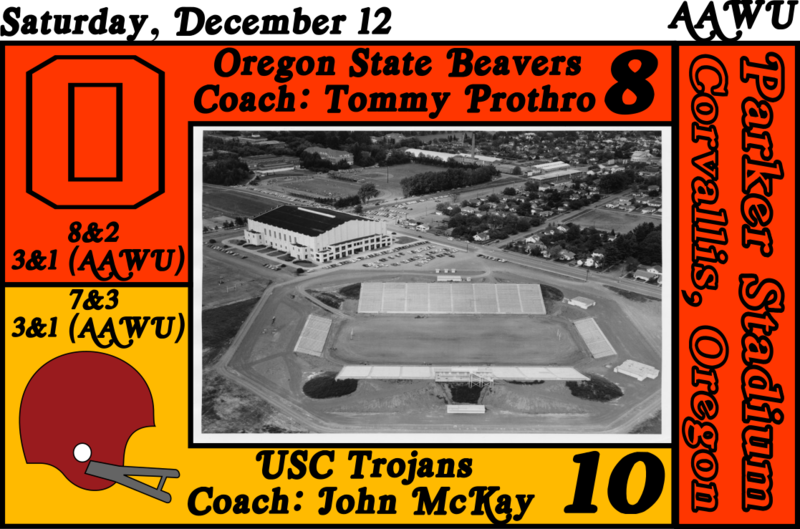 Based on what you know now who would you like to see host the 1967/68 National Championship Game 6? So now you can vote on this question as well. What city do you want to see host the 1968/69 National Championship Game 7? Again, the lowest vote getting in both of these questions will be eliminated from the running at next seasons annual meetings. Do you think they would create a conference for schools in the Northeast? IMO, the lack of an established conference for that (the ACC was a mid-Atlantic thing till recently) caused a huge percentage of the conference alignment headaches we have today. So certainly, the lack of presence in the northeast, two years into the CBCS, is evident. The 2nd national championship game which is about to be played will be the 20th game thus far. If we were to divide up where those games have been played 7 will have been played in the deep south (2 Mississippi, 3 Louisiana, 1 Alabama, 1 Florida), 5 on the West Coast (California 4, Washington state 1), 4 in the western plains (Oklahoma 1, Nebraska 1, Texas 3), 3 in the mid-west (Wisconsin 1, Illinois 2) and only 1 in the northeast (New York). The lone northeast game was the first national championship game played at Yankee Stadium in New York. So, it was an awarded pre-determined location presented by the committee. Among the 17 schools that have made it into the tournament thus far, not a single one could be said to be from the northeast. Navy, the most recent season’s wild card qualifier, is perhaps the closest the northeast has gotten to qualify a program. Navy would hardly, as I would imagine you would agree, be considered to be from the northeast. Mid-Atlantic, Chesapeake, or Southern would better describe it regionally speaking. Being that I have used actually real historic standings I would be inclined to suggest that perhaps the lack of northeastern presence is just indicative of the fact that other regions of the country, most evidently the deep south, invest more in college football and are consequently more successful in it. This is not to say the northeast has an empty trophy case. The big cities of the northeast have of course long dominated professional sports in this country; the New York Yankees, Boston Celtics, Philadelphia 76ers (long before trust the process), Pittsburgh Steelers, New York Giants, and others. Now I’ll confess I’m a west-coaster, so excuse my ignorance if I do expose it, but it has always seemed to me that in the northeast people have always cared more about professional sports then college. With all that having been said I find your statement “IMO, the lack of an established conference for that (the ACC was a mid-Atlantic thing till recently) caused a huge percentage of the conference alignment headaches we have today.” thought provoking. Not only are you suggesting that modern conference alignment is a nightmare because of the mistakes in the past, you are in the same breath suggesting that the northeast has been the victim of this mismanagement and that has at the least contributed to poor historic performance and presence of northeastern college football programs. Correct me if I have read too much into you statement. Even if I have however it has already added to the discussion on the subject in my own head. While my original intent for this thread was to stick to actual history as close I can, I think I may be willing to venture out a little more into the fictional. I think doing so provides me a little more advantage to create unique story lines for this thread and develop a little more original content. So, let me just say this, in the world of the CBCS the committee, the sports media, and northeastern fans have begun a discussion on the subject. The public discussion will put so much pressure on the NCAA, the CBCS, and the conferences that change is coming! Stay tuned. Sometimes championship games start in way that makes you think “these are the two best teams of the year?” In the first quarter no one could score. No one could hold onto the ball. Each team fumbled the ball twice. Both times Illinois gave it up when they did so. As for Texas they lost it once but recovered it a second time. Perhaps that lone thing that sort of went right was a harbinger of things to come. The subtle early indicator that we got that Texas was indeed the better team. One would think but Texas also had an interception in the quarter while Illinois did not. The first quarter featured four turn overs but not a single point. The game did not clean up much by the second quarter. In this frame both teams would throw an interception. Texas had one more turnover on a fumble. The lone offensive positive of the quarter was a long drive that Illinois strung together that resulted in a 2-yard rush for a touchdown. At the half most, things seemed to be indicating that Illinois could actually win this thing. They had fewer turnovers, their defense was once again showing itself to be great, and they had a touchdown lead on the scoreboard. Texas had the ball to start the second half. Something shifted in the locker room at half-time because they were now a team with swagger. They manhandled the Illinois defense on a long opening drive that ended with a 4-yard passing touchdown. Now the score was even at 7. The Longhorn offense had it going, now the question was the Longhorn defense feeling the same swagger? YES they were! The Longhorns held the Fighting Illini to only 3 plays before they had to punt. The Longhorns second-second half possession was a repeat of the their first-second half possession. It ended on a 3-yard rush for a touchdown. The Longhorns now lead 14-7. The Longhorn offense did the same thing on the second possession that they had on the first and not to be outdone the defense made sure they did the same. Now the Longhorns had the ball again and they were rolling. Right? Well maybe not. As they were working down the field they once again fumbled the ball. Illinois picked the ball up and ran it back for a 34-yard touchdown. Now the score was tied at 14. Forcing Texas 3 and out on the next possession, Illinois got the ball back with time still available in the third quarter. Illinois made a drive down field and set up for a 9-yard field goal to give themselves the lead at the end of the third quarter 17-14. Illinois had a lead going into the fourth quarter, but they fell apart in that last period of the game. On their first drive they gave up the ball following a fumble. Texas struggled to drive the ball down field on the ensuing drive but then they broke through with a 35-yard pass for a touchdown. Now Texas was in front on the score board 21-17. On the ensuing possession Illinois again fumbled the ball and again Texas got the ball. Also, again Illinois was containing the Longhorns. Somehow however Texas nailed a 42-yard field goal. Now they were up 24-17. If you think that was impressive Illinois got a 52 yarder on their next possession. Now the score was 20-24 but Texas was still in front with time running out. Texas got the ball back and once more scored a touchdown. This following a drive and coming on a 6-yard rush at the end of that drive. This brought us to our final score of 31-20. As time was running down and Illinois was trying to make something happen they fumbled it one last time. Texas recovered the ball and that basically did it. 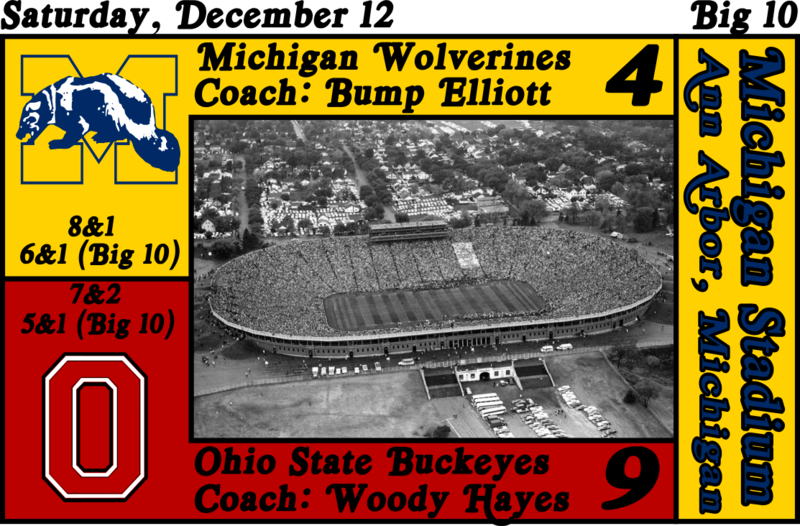 The 1964 college football season ended on November 28. Before getting into all things 1964 I do want to digress a little bit because I did overlook one thing announced at the annual meetings. The Rose Bowl has hosted a Bowl Semi-Final for two years so it will now steep aside. Replacing it will be the Cotton Bowl. Five programs will be making their debut in the CBCS this season. 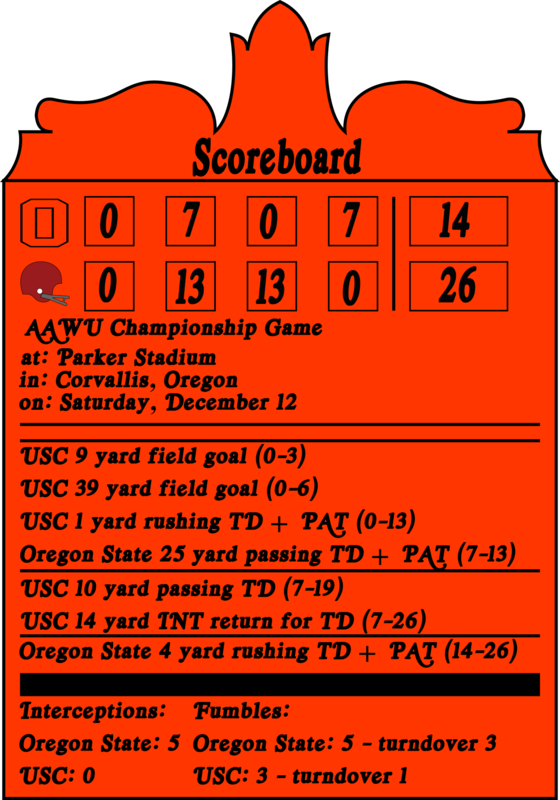 In the AAWU championship Oregon State is making their debut and they will be hosting that conference championship game. 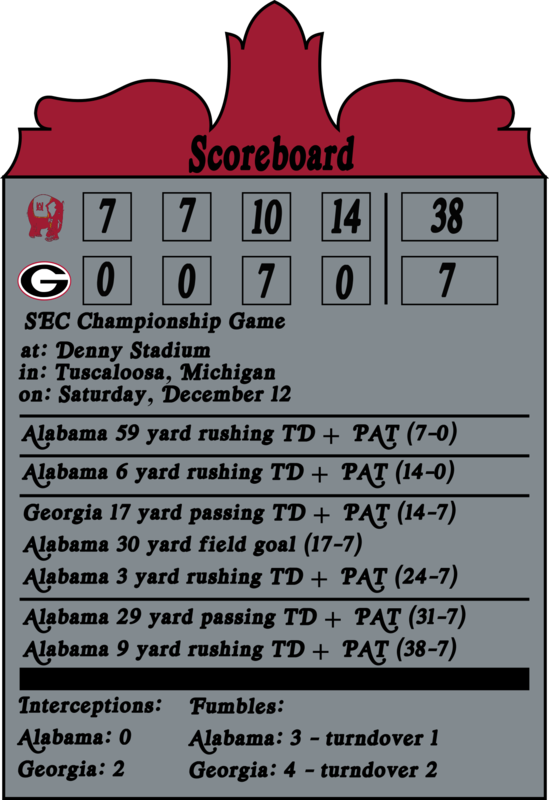 Georgia, is unranked but they finished second place in the SEC and will therefore make their CBCS debut in that conferences championship game. Notre Dame, an independent is the highest ranked team not in a conference championship, so they have earned this years wild-card. This brings them to their debut. Meanwhile the Big 10 championship will feature 2 teams making their debut. This is the second year in a row that this has happened. 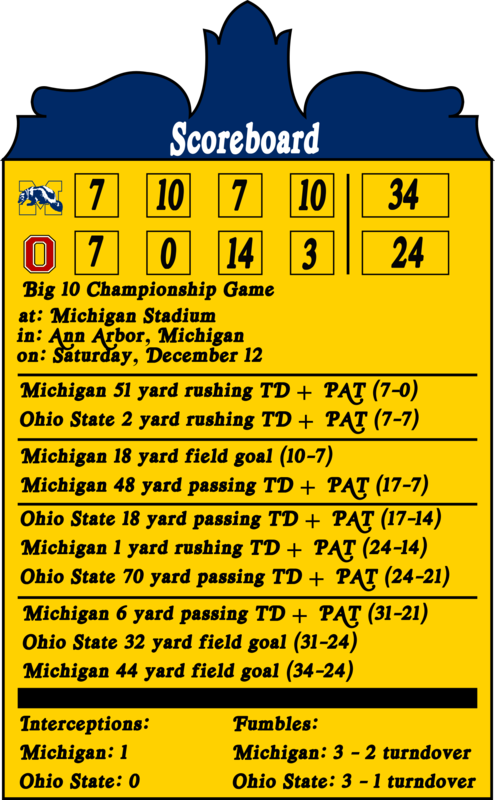 In three years the Big 10 has now sent 6 different teams to their conference championship. This year it is the Michigan Wolverines and Ohio State Buckeyes getting in for their first shot at the tournament. Three teams have made it into the tournament for the third straight year; the USC Trojans, Oklahoma Sooners, and the Texas Longhorns. USC and Texas have each won a championship while the Sooners have not made it past the second round. This year the Sooners are in as an unranked team. They finished second in their Big 8 conference and will face the conferences defending champion Nebraska Cornhuskers. Alabama and Arkansas, the number 1 and 2 teams respectively, are returning to the tournament after having not made it last season. They each lost their conference championship back in 1962 but this time around they get to host their conference championship. 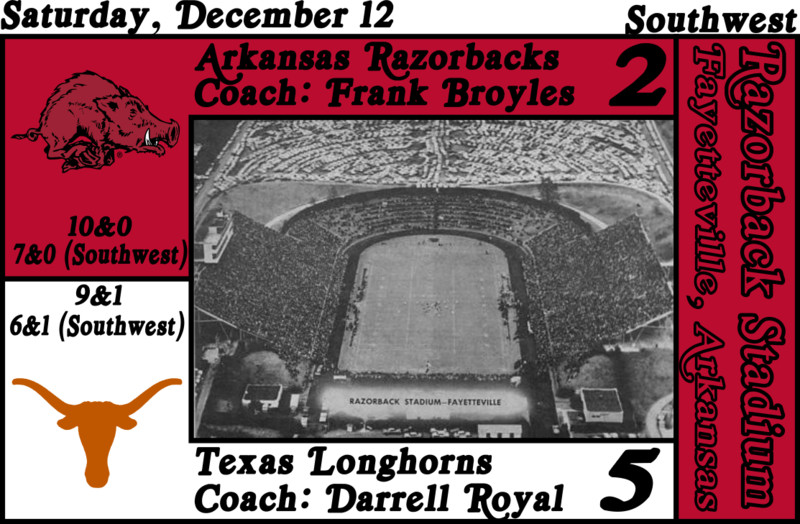 For Arkansas it is a repeat against the defending champion Texas Longhorns, who are ranked #5. 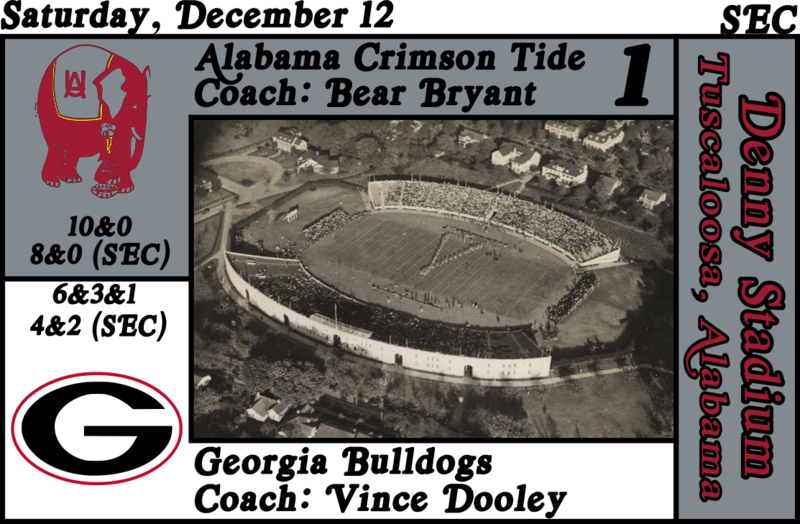 Alabama meanwhile will host the Georgia Bulldogs, a team making their debut and who are unranked. LSU is the lone ranked team that will not qualify for the playoffs. They are also in the SEC but because Georgia has a better in conference record then they do, Georgia gets in unraked while LSU is on the outside looking in. would love to see championship game field designs for these. would be pretty cool.